When it comes to climate science reporting, the Mail on Sunday and Telegraph are only reliable in the sense that you can rely on them to usually get the science wrong. This weekend’s Arctic sea ice articles fromDavid Rose of the Mail and Hayley Dixon at the Telegraph unfortunately fit that pattern. The reason so many climate scientists predicted more ice this year than last is quite simple. There’s a principle in statistics known as “regression toward the mean,” which is the phenomenon that if an extreme value of a variable is observed, the next measurement will generally be less extreme. In other words, we should not often expect to observe records in consecutive years. 2012 shattered the previous record low sea ice extent; hence ‘regression towards the mean’ told us that 2013 would likely have a higher minimum extent. The amount of Arctic sea ice left at the end of the annual melt season is mainly determined by two factors – natural variability (weather patterns and ocean cycles), and human-caused global warming. The Arctic has lost 75 percent of its summer sea ice volume over the past three decades primarily due to human-caused global warming, but in any given year the weather can act to either preserve more or melt more sea ice. Last year the weather helped melt more ice, while this year the weather helped preserve more ice. Last year I created an animated graphic called the ‘Arctic Escalator’ that predicted the behavior we’re now seeing from the Mail on Sunday and Telegraph. Every year when the weather acts to preserve more ice than the previous year, we can rely on climate contrarians to claim that Arctic sea ice is “rebounding” or “recovering” and there’s nothing to worry about. Given the likelihood that 2013 would not break the 2012 record, I anticipated that climate contrarians would claim this year as yet another “recovery” year, exactly as the Mail on Sunday and Telegraph have done. Arctic sea ice extent data, 1980–2012. Data from NSIDC.In short, this year’s higher sea ice extent is merely due to the fact that last year’s minimum extent was record-shattering, and the weather was not as optimal for sea ice loss this summer. However, the long-term trend is one of rapid Arctic sea ice decline, and research has shown this is mostly due to human-caused global warming. When Will the Arctic be Ice-Free? Both Rose and Dixon referenced a 2007 BBC article quoting Professor Wieslaw Maslowski saying that the Arctic could be ice free in the summer of 2013. In a 2011 BBC article, he predicted ice-free Arctic seas by 2016 “plus or minus three years.” Other climate scientists believe this prediction is too pessimistic, and expect the first ice-free Arctic summersby 2040. It’s certainly difficult to predict exactly when an ice-free Arctic summer will occur. While climate research has shown that the Arctic sea ice decline is mostly human-caused, there may also be a natural component involved. The remaining sea ice may abruptly vanish, or it may hold on for a few decades longer. What we do know is that given its rapid decline, an ice-free Arctic appears to be not a question of if, but when. Both articles also wrongly claimed that global warming has “paused” since 1997. In reality, global surface temperatures have warmed over the past 15 years, albeit more slowly than during the previous 15 years. It is possible to cherry pick a shorter time frame over which global surface temperatures haven’t warmed, as I illustrated in my other animated ‘Escalator’ graphic. Average of NASA GISS, NOAA NCDC, and HadCRUT4 monthly global surface temperature anomalies from January 1970 through November 2012 (green) with linear trends applied to the timeframes Jan ’70 – Oct ’77, Apr ’77 – Dec ’86, Sep ’87 – Nov ’96, Jun ’97 – Dec ’02, and Nov ’02 – Nov ’12.However, the opposite is true of the overall warming of the planet – Earth has accumulated more heat over the past 15 years than during the prior 15 years. 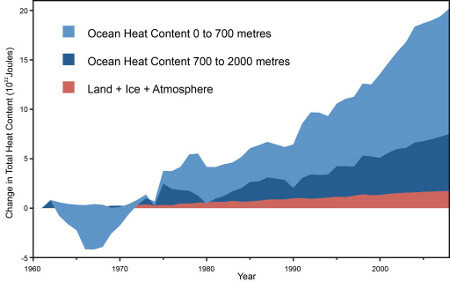 Global heat accumulation data (ocean heating in blue; land, atmosphere, and ice heating in red) from Nuccitelli et al. (2012). Recent research strongly suggests that the main difference between these two periods comes down to ocean heat absorption. Over the past decade, heat has been transferred more efficiently to the deep oceans, offsetting much of the human-caused warming at the surface. During the previous few decades, the opposite was true, with heat being transferred less efficiently into the oceans, causing more rapid warming at the surface. This is due to ocean cycles, but cycles are cyclical – meaning it’s only a matter of time before another warm cycle occurs, causing accelerating surface warming (as Tsonis’ research shows). It would be foolhardy for anyone to predict future global cooling, and those few who are so foolish are unwilling to put their money where their mouth is, as my colleague John Abraham found out when challenging one to a bet, only to find the other party unwilling to stand behind it. Unfortunately that didn’t stop Rose from inventing this meeting, or Dixon from repeating Rose’s fictional reporting in the Telegraph. Finally, both articles quoted climate scientist Judith Curry claiming that the anticipated IPCC statement of 95 percent confidence that humans are the main cause of the current global warming is unjustified. However, Curry has no expertise in global warming attribution, and has a reputation for exaggerating climate uncertainties. In reality, the confident IPCC statement is based on recent global warming attribution research. More on this once the IPCC report is actually published – any current commentaries on the draft report are premature. These two articles at the Mail on Sunday and Telegraph continue the unfortunate trend of shoddy climate reporting in the two periodicals,particularly from David Rose. They suffer from cherry picking short-term data while ignoring the long-term human-caused trends, misrepresenting climate research, repeating long-debunked myths, and inventing IPCC meetings despite being told by climate scientists that these claims are pure fiction. Based on their history of shoddy reporting, the safest course of action when reading a climate article in the Mail on Sunday or Telegraph is to assume they’re misrepresentations or falsehoods until you can verify the facts therein for yourself. A cold Arctic summer has led to a record increase in the ice cap, leading experts to predict a period of global cooling. There has been a 60 per cent increase in the amount of ocean covered with ice compared to this time last year, the equivalent of almost a million square miles. In a rebound from 2012’s record low, an unbroken ice sheet more than half the size of Europe already stretches from the Canadian islands to Russia’s northern shores, days before the annual re-freeze is even set to begin. The Northwest Passage from the Atlantic to the Pacific has remained blocked by pack-ice all year, forcing some ships to change their routes. A leaked report to the UN Intergovernmental Panel on Climate Change (IPCC) seen by the Mail on Sunday, has led some scientists to claim that the world is heading for a period of cooling that will not end until the middle of this century. If correct, it would contradict computer forecasts of imminent catastrophic warming. 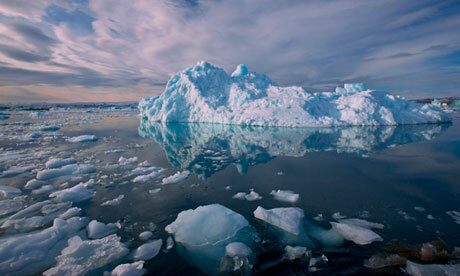 The news comes several years after the BBC predicted that the arctic would be ice-free by 2013. Despite the original forecasts, major climate research centres now accept that there has been a “pause” in global warming since 1997. The original predictions led to billions being invested in green measures to combat the effects of climate change. The changing predictions have led to the UN’s climate change’s body holding a crisis meeting, and the IPCC is due to report on the situation in October. A pre-summit meeting will be held later this month. But the leaked documents are said to show that the governments who fund the IPCC are demanding 1,500 changes to the Fifth Assessment Report – a three-volume study issued every six or seven years – as they claim its current draft does not properly explain the pause. The extent to which temperatures will rise with carbon dioxide levels and how much of the warming over the past 150 years, a total of 0.8C, is down to human greenhouse gas emissions are key issues in the debate. The IPCC says it is “95 per cent confident” that global warming has been caused by humans – up from 90 per cent in 2007 – according to the draft report. However, US climate expert Professor Judith Curry has questioned how this can be true as that rather than increasing in confidence, “uncertainty is getting bigger” within the academic community. Long-term cycles in ocean temperature, she said, suggest the world may be approaching a period similar to that from 1965 to 1975, when there was a clear cooling trend. At the time some scientists forecast an imminent ice age. The IPCC is said to maintain that their climate change models suggest a pause of 15 years can be expected. Other experts agree that natural cycles cannot explain all of the recorded warming.